Here is an excellent video conference between the guy that has the Military Arms Channel and Gunowners of America's Erich Pratt. It is long, over an hour, but well worth the viewing. This is important, pertinent stuff, so give it your attention. 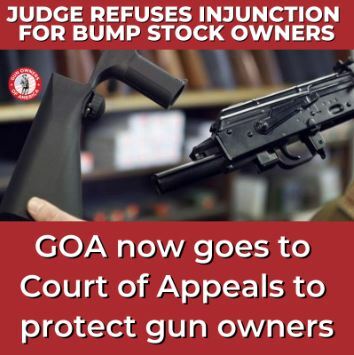 Well, at the eleventh hour, just four days before the bump stock ban becomes effective, a federal District Judge in Michigan finally issued his ruling on GOA’s request for a preliminary injunction blocking the bump stock ban. Despite our repeated pleas to expedite this case, the judge waited to virtually the last minute to issue his ruling denying our motion. All across the country, gun owners have been experiencing the same harsh treatment — except for the District Court in Utah which granted a temporary injunction yesterday. But that injunction only applies to one bump stock owner in the entire nation. Not only that, the district court deferred to the ATF’s supposed “expertise” — a federal agency that has entrapped gun owners in the past. In one famous case, the ATF even used a shoe lace to “convert” a semi-automatic into a machinegun, and thus claimed that the gun owner was in possession of an unlicensed machinegun. Along these lines, GOA had pointed out (during oral arguments) how rubber bands can be easily used to bump fire an AR-15. So using the ATF’s rationale that a bump stock turns an AR-15 into a machinegun, we noted that the ATF could easily interpret the possession of rubber bands and an AR-15 to be “constructive intent” to convert the semi-auto into a full auto. What’s more, the judge claimed that federal law in regard to the definition of a machinegun is “ambiguous.” Hence, the judge claimed, it is justified for the ATF to interpret the law the way they have. For decades, courts consistently concluded that the statute was unambiguous…. Suddenly now, our separate and jealously independent third branch of government is consistently concluding that the statute is ambiguous…. In the future, when otherwise-law-abiding bump stock owners inevitably are prosecuted for possession of unregistered machineguns, will the courts flip back, and conclude that the statute is again unambiguous? So here’s the bottom line: Gun Owners of America has asked the Sixth Circuit Court of Appeals in Cincinnati, Ohio to grant an immediate stay so that gun owners will be protected, and not have to turn in or destroy their bump stocks, while we argue the merits of the case. You can read our Sixth Circuit request here. Where do gun owners go from here? We hope to hear from the Sixth Circuit Court of Appeals by Monday at the latest, with some indication of whether they will grant us a stay of the March 26th deadline. Bump stock owners might want to wait at least until we have some indication of whether the stay will be granted. So be sure to check our website for updates on Monday. Although the courts could still overturn the ban at some future date, we don’t expect that their relief would include compensation for someone who had already relinquished or destroyed their property. And, no, we don’t expect you would get compensation, even if you refuse to sign ATF’s form giving up your constitutional rights. Just so you know, the ATF has provided two forms for bump stock owners to use if they choose to forfeit their bump stocks to the ATF, rather than destroying them. If you contact ATF to turn in a bump stock, the ATF will likely ask owners to sign ATF Forfeiture (Form ATF 3400.1) and/or Property Receipt (ATF 3400.23) forms. The ATF Forfeiture form is a waiver of your rights and releases ATF from all liability. So read the form — and talk to your own attorney if you are thinking of signing it! Even if a court later decided against ATF, a person who signed this form would have no claim. Unlike the ATF Forfeiture form, the Property Receipt form is simply an acknowledgement that ATF has received your bump stock and you no longer possess it. If you plan to turn it in, then get the ATF to sign this form as a receipt, and you keep a copy. 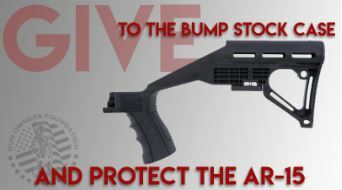 Of course, the alternative is destroying the bump stock — an act which would not require any reporting to or verification by the government. And, while we are not advocating this, we suspect a lot of people are just going to hold on to their bump stocks pending the courts’ final disposition of the issue sometime in the future, but that comes at the risk of possessing an illegal and unregistered machine gun. There will be several cases — including ours — that will continue to challenge the legality of the bump stock regs, even beyond next week’s destruction or turn-in deadline. But after next Monday, gun owners should not expect any decisions in the near future. I realize that this has not been a lot of good news. However, if there is any “silver lining,” it is that the higher we appeal, the greater our likelihood of success. The Sixth Circuit is conservative — skeptical of government overreach and leaning pro-gun. But as you can imagine, each appeal gets more and more expensive, as we battle a government “Goliath” which has endless funds. I truly appreciate all the support that GOA members have given to make this case possible. If you’d like to make a contribution to help us pursue further litigation in this matter, you can give a tax-deductible donation here. Congress defined Automatic weapons in the 1934 and 1968 and 86 Firearms acts. Only Congress can change the definitions. Certain limited authority was transferred but not authority to change definitions. Since I don't just waste ammunition I have no interest in buying a bump stock. Since they do not fire the second and following shots unless the user pushes the rifle forward, a second action is required to pull the trigger. The gun has to recoil enough to let the finger rest lift the finger off the trigger so it can reset. Then pushing forward causes the finger to contact the trigger again. Yes, it makes more noise faster but targets had better be the size of a big cow barn. This will go to SCOTUS and several gun laws and any felony charges and convictions wail be set aside. The people think the Constitution protects their rights; But government sees it as an obstacle to be overcome. If your religion says suicide and murder are wrong; Aren't you doing both if you are not prepared to defend your life and the lives of others? I am not a lawyer, but I have personal opinions. BTW, just cut the finger rest off with a hacksaw and it isn't a bump stock anymore, In a few years when the Courts have ruled you could glue it back on. I am not a lawyer and ATF might not care. Last edited by Jim Macklin; 03-27-2019, 17:47. I have no problem donating to SAF/CCRKBA, they have been effective in the past, but the NRA sold out the bump stock, and they have compromised gun rights in the past--it seems to be largely made up of Fudds and paper punchers, not real Minutemen. NRA, strictly all about the money. When Wayne LaPierre is eating bologna sandwiches for lunch, I'll consider making a donation to the NRA. Until then, they ain't getting a cent. All times are GMT-1. This page was generated at 22:26.